More than 6 million youth are involved in 4-H and FFA. And while not all these young people are involved in livestock projects, all of these young people are consumers and do want a safe, nutritious eating experience. That’s why it is important for BioZyme® dealers to support youth projects and events. While the support of the project or event is beneficial to the young people involved, as supporters, we often get to share our story; telling everyone that our products are all-natural and will only continue to help the animals feel good, stay healthy and perform to their upmost potential. 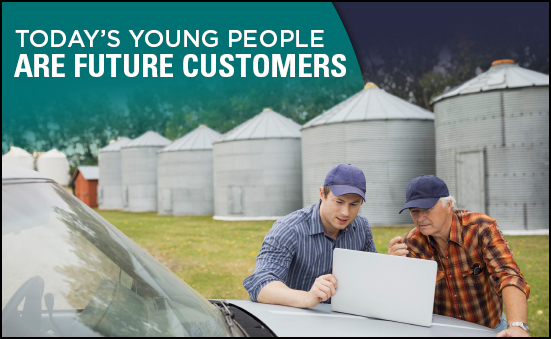 There are many ways to support the youth – or the future – of our industry. Remember, every time we give, we are making an investment. It is easy to write a check to group or an organization for a show sponsorship. But have you ever considered sponsorship in the form of product? Many shows are looking for “new and exciting” awards or ways to make winning the show seem more appealing. What is more exciting or appealing than winning a bag or bucket of Sure Champ Extreme with Climate Control? Be sure to include your contact information along with a product brochure. Those winners just might be your newest customers. Giving our time to young people is vital. And in youth projects, there are so many things to learn – feeding, fitting, showing, judging, skin and hair care. As a dealer, you are likely an expert in at least one of these areas or know someone who is. Take the time to host a day or 1/2-day workshop or work with another company to co-host an educational workshop. You don’t have to tackle every subject or every species all at once. And, at the end of the day, have a drawing for a bag or tub of product. One example of an educational workshop was a roping clinic recently conducted by Vitalize Ambassador Whitney DeSalvo. Each participant received a tube of Vitalize® Equine Recovery Paste and a Vitalize cap. A bag of Vitalize product was rewarded to one of the young participants based on merit. Giving away product might cost you initially, but it might also gain you a lifetime customer, and you will see the ROI mount over time. Offer to make stall cards for your customers prior to the county or district fair. Don Bush with Powell Feed & Milling in Arkansas, said Powell makes its own line of show feeds, with the assistance of Dr. Susan Day. Last year, Powell feed provided stall cards to its Powell Show Feed customers to use at the area fairs, to recognize their customers, and help the young people have a more professional and neater looking display at the fair. Bush said the youth appreciated the added gesture, and he anticipates this is a program that Powell’s will continue. With many stores in many counties, Bush said it was going to be nearly impossible to support each Powell customer. Kirk Powell, the company owner, said he would rather donate back the profit margin from show feeds to all the youth than buy just one kid’s animal. And that is what he did. At the end of the summer, Powell Feeds calculates the profits from its show feed sales and divides it among all the youth who buy feed from their various stores. Then, the kids get a certificate worth a specified amount to use at any of the Powell stores. “We can buy one animal, spend $3,000 and impact one child, or we can take all the profit from our show feed business and spread it amongst every one of them. And some of those kids who don’t win, it means more to them than the kids who do win,” Bush said. Remember, youth are the future. They are future leaders, future decision makers and future customers. The decisions you make today to support youth will impact them and your business now and in the future. For years grandpa and dad made all the purchasing decisions around the farm or ranch. They decided which color of tractor to drive, which bulls to breed the cows to and even which minerals to feed. But as the years go by, the next generation of customers – my generation – is starting to make buying decisions. And as a millennial, I might need you to reach out to me just a little differently than dad and grandpa did. Reach out to me early on. As part of the millennial generation, I might already be a customer of yours, especially with show livestock and performance horse product lines such as Sure Champ® and Vitalize®. But just because I’m young, doesn’t mean I’m not interested in other product lines. Keep the lines of communication open, and make sure I know how to reach you when I do need to buy more products for my growing livestock operations. For example, I might be buying Sure Champ for my show animals now, but as I develop my herd or take over my family’s herd, I will want to learn more about the VitaFerm line of products and how they will keep my cattle healthy, performing and help increase profitability. Show us results. My generation thrives on instant gratification. We like to see results and we like to see them quickly. Share research summaries with us that describe the results we might see with your products. We also like to hear from others who have had great experiences. Providing a sample of a quick-response product like Vita Charge Paste is a good idea, too. These kinds of samples are great door openers to conversations about other products and one of the best investments you can make. Be innovative and stay connected with us. Our generation has technology at our fingertips. We get news from social platforms like Twitter, Instagram and Facebook, and if we are going to learn about your products and services, you’re likely going to have to promote them on social media as well. That connectivity is a two-way street. “Word of mouth” is still the most powerful marketing tool, but instead of us setting around the local feed store or coffee shop, we comment and share on social media. We like to share positive comments on our experiences, so look for those as we engage with you on Twitter, Instagram and Facebook! Have a conversation with us. Millennials like to be engaged. We don’t want you to give us a sales pitch. We want you to talk to us and include us in the conversation, so we feel like part of the solution. Start the conversation with questions to discover our goals and priorities and give us options. Be authentic. Because technology is so easily accessible, the ability to find answers to our questions usually is too. We will do our own research and find out in a heartbeat if you have clouded over anything just to make a sale. Times are changing, but thanks to the foresight and leadership of my dad and grandpa, I’m ready to start making decisions about our operation. Just remember, I make decisions a little bit differently than the generations before me, but keep your conversations real, show me results and work with me, and this potential customer will become your regular customer. Keep connecting with me in innovative ways as technology changes and evolves, and watch your business grow. For 25 years Don Bush, Powell Feed & Milling, knew Ken Gillig and competed against him in the world of animal nutrition. Gillig, the BioZyme® Key Accounts Manager since 2016, was formerly an ASM, and Bush had been selling Purina through Powell Feed & Milling in various stores in Northern Arkansas. However, at the 2014 Missouri State Fair, the friendship between Gillig and Bush became even more important when Bush’s daughter’s ram got very sick in the breeding sheep barn. Bush recalls that Gillig told him he had something he wanted him to try. After that experience with his daughter’s prize-winning sheep projects, Bush knew there was something about the BioZyme products that worked. He helped Gillig get some supplements to producers down around him and told his boss he wanted to introduce the products into the Powell Feed Stores. Skeptical about the price of the products, he agreed. And Powell Feed & Milling has watched its BioZyme product sales grow, all while reaching VIP Dealer status each year. “I knew it worked for us. I knew it would work for others,” Bush said. 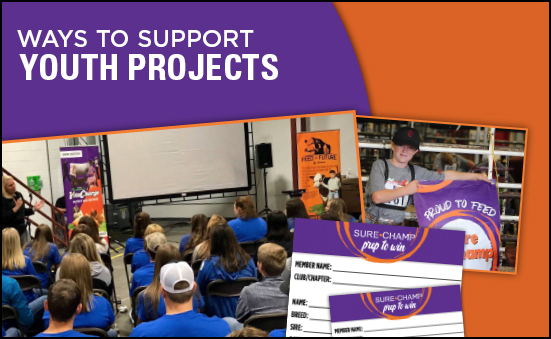 Bush’s situation is a perfect example of why reaching out to young livestock exhibitors and sharing products are effective ways of promoting the products. If Gillig hadn’t shared the Vita Charge products with him, his daughter might have had a dead ram. And furthermore, BioZyme might have one less VIP dealer who has helped the health and performance of many producers in a large part of Northern Arkansas. Don’t discount the youth exhibitor. They might buy a bag or a bucket of Sure Champ® products. Or maybe a young equestrian uses the Vitalize® products. However, those youth likely have parents who own livestock or a business who could be positively impacted by the BioZyme products as well. Potential opportunities are everywhere. Ken Gillig seized the opportunity to help a young sheep exhibitor at the Missouri State Fair. But what he ultimately did was help grow business and change the lives of many livestock producers for years into the future. Facebook. YouTube. Twitter. Instagram. Snapchat. These are just a few of the social media platforms that your customers or your customers’ kids engage with on a daily basis. And they are becoming some of the most widely used marketing tools out there. If you are looking for a timely way to reach and interact with your customer base, social media is the tool to use, and unlike some predictions of less than a decade ago, social media is here to stay. The reach and engagement is so widespread when using social media, it is hard to deny that it is an effective way to reach a large following very quickly and at a very low cost. According to an April 2017 report on ebizmba.com, 1.5 billion unique users visit Facebook each month. Granted those users span the globe, that is an amazing number of people to reach with your message. 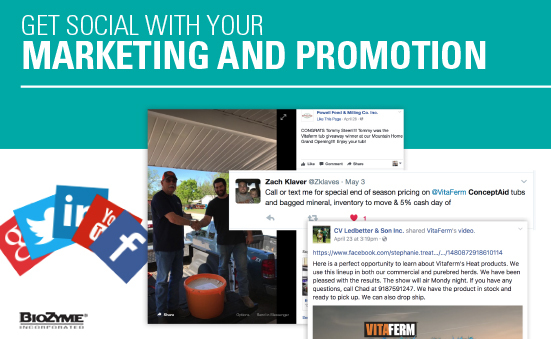 BioZyme® wants you to succeed in your online presence and posts regularly to its multiple Facebook pages, making content readily available for you to share from your dealer or personal pages. Many BioZyme brands have a Facebook page with content posted regularly. With just a click of the ‘share’ button, you can add that content onto your company Facebook page as well. Here are just a few examples of ways you can use social media to engage with your customers. Promote your products. Did you just get a shipment of a new product in? Take a photo and post it to your social media accounts. A picture is truly worth a thousand words on social media. Create a hashtag and use it properly. Hashtags, the little pound symbol before a group of words, can be a powerful way to reach a group of like-minded people. For example, “#surechamp is great product to keep your show animals on feed this summer,” might be a tweet you post, with a link to Facebook page and a promotion on Sure Champ. Young people familiar with the brand name, but not exactly what it does might click on that post, and learn more and become your next customer. Host a contest. Sure Champ® already posts judging classes to its Facebook page. Perhaps you can share this, and you can reward a local winner with a cap or a tube of Vita Charge® Paste. Or make up your own contest. May is beef month, so host a photography contest where your customers can submit their favorite photo of cattle, and then entries are voted on by others on social media. Recognize your customers. You just hosted a customer appreciation event. Post photos of those who attended, and especially any big door prize winners. Educate your customers. Share articles of interest with them from other news sites or groups. Chances are if you post these items of interest, your social page will become a one-stop source for your customers. Adding a quick thought about the information you’re sharing is always a great way to continue the conversation with your followers. It’s time to get social. Promote your business and reach out to your customers. Two of the most fundamental business investments we can make are in our future and in our people. BioZyme Inc. has committed to investing in both of those areas with the creation of the Feed The Future partnership it formed with the Hereford Youth Foundation of America (HYFA). “Bob and Lisa both feel it is import to make an impact on the next generation of agriculturalists and that is why this program was created,” said Crystal Blin, Marketing Program Manager. For every receipt BioZyme receives from select VitaFerm® products, BioZyme will donate $1 to the HYFA, with a goal of making a $100,000 donation in October 2017. American Hereford Association members and commercial producers who use purebred Hereford bulls are encouraged to send in copies of their receipts or invoices, and Blin said they can submit receipts as far back as Sept. 1, 2016. In addition to the program being a great way to make a difference in the young people involved in agriculture, Feed the Future can serve as a great marketing tool for dealers. 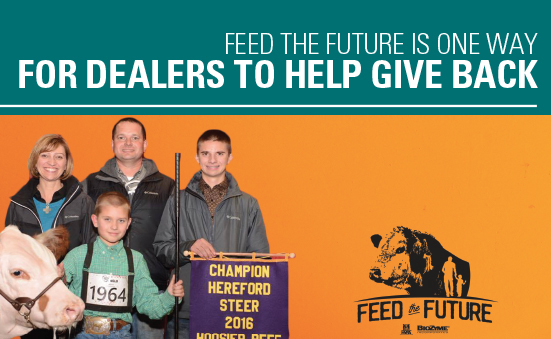 “Because most Hereford breeders are extremely passionate about HYFA and supporting their junior members, dealers can mention the Feed the Future program to breeders and it can be a great way to start a dialogue and potentially gain new business,” Blin said. As of May 1, Blin has collected copies of receipts from Hereford enthusiasts and dealers, equating to nearly $4,800, noting that several dealers will send in the receipts for their customers. “I will send in the copies of my customers’ receipts for them so it is not an extra burden, yet they feel like they are giving back and helping the youth,” said Sue Kline from The Feed Bunk in LeRoy, Ill.
Kline adds that she typically sells a lot of VitaFerm, but that she has promoted Feed The Future in her store and on social media, and encourages other dealers to do the same to promote the program. All people want to support youth in agriculture; it makes them feel good she said, and so letting them know that their purchase of particular products might help the youth will help spur sales. Blin said there are several ways to market VitaFerm products while promoting the program. She suggests asking the customers who use Hereford genetics if they do use VitaFerm products, and if not, to consider making the switch, knowing a monetary contribution would be made to an organization the producers are passionate about. Next, she said if they are only using Sure Champ® or they don’t use a VitaFerm product year-round, they might be interested in learning more about qualifying products like Concept•Aid®, Heat™, Cattleman’s Blend™, 30:13% Protein Tub, Roughage Fortifier® and Sure Start® Pellet. Overall, Feed The Future is a win-win-win program for the youth, the producer and the dealer. The youth of the Hereford breed are receiving a great donation, the producer is keeping his or her animals healthier and gaining and the dealer is increasing sales and building relationships. To learn more about this program, visit www.vitaferm.com/feedthefuture. When it comes to kids, parents are usually not afraid to spend a little extra money to invest in their activities. Parents will spend money on sports camps, dance clinics, traveling ball leagues and personal trainers and coaches. And that is just the beginning. There are still participation fees, uniforms, equipment, lodging, travel and meals. Showing livestock is no different – you have the initial investment of the animals, nutrition and health protocols to follow, bedding, equipment and fitting supplies not to mention entry fees and lodging, travel and meals. But once you’ve made that initial investment in your livestock project, don’t you want to make sure it stays healthy while eating and gaining weight? 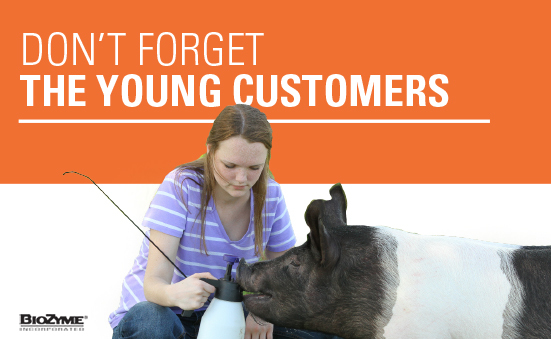 That is why it is super important to focus on our younger customers – those who participate in youth livestock projects and their parents. “I always ask if they ever had an animal that went off feed or water when they got it to a show. It doesn’t matter if they showed at a county fair or all over the country, almost everyone recalls that memory, it strikes up a conversation, and then I tell them I have an insurance policy for them with added benefits,” Creamer said. In addition to helping “insure” the show animals won’t go off feed again, Sure Champ products have many benefits including a healthy skin and hair coat and keeping animals gaining in an efficient manner. 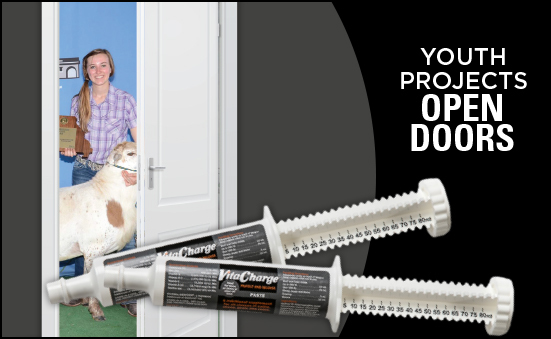 There are also complementary products in the Vita Charge® line that offer the convenience of different forms of delivery, including Vita Charge Stress Tubs that don’t have to be hand mixed with each feeding. Creamer offers other suggestions for helping promote the Sure Champ line to customers and their kids for their summer show projects. Creamer said the 10-pound bag of Spark is a good size to have at the counter. When a customer buys any show feed, it is great to start up a conversation about Spark and how to use it in conjunction with the show feed that is being purchased. Another creative promotion Creamer has encouraged her dealers to try is setting a jar of red hots on the counter and having customers guess the correct number in the jar; the closest guess wins a shirt or a tube of Sure Champ Climate Control Paste. Creamer also encourages her dealers to engage on some type of social media since the young exhibitors are so in-tune and already having conversations in that space. Perhaps the most important tool Creamer uses is talking about the Amaferm® advantage, and how it helps the animals grow and gain. And although it varies by region and dealer, most of the products will only cost about 50 cents per animal/day – a pretty easy investment when talking about kids being successful in the show ring. “A lot of my customers care about the rate of gain contest or carcass contest at their county fairs. I will tell them about Sure Champ and how that will help their animals put on pounds quickly no matter the show feed ration they are feeding,” Creamer said. 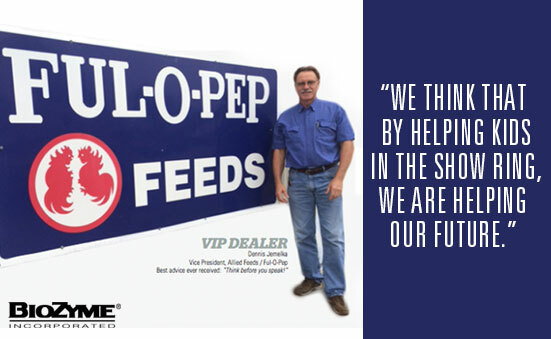 The makers of Allied Feeds and the Ful-O-Pep brand are proud of their product and their customers’ successes with feeding their product. Just like any feed store, they work to build strong relationships and provide products people want for their livestock. What’s unique about Allied Feeds is that nearly one-third of its customer base is livestock show families. The Allied Feeds brand, Ful-O-Pep Feeds, is specially formulated for show cattle, swine, sheep, goats, poultry and rabbits. Their product is sold across Texas and into Louisiana, Oklahoma, Arkansas and North Carolina thanks to their nearly 150 dealers who recognize and sell BioZyme® products. Allied Feeds is owned by the Greg Gossett family, who also owns the Ful-O-Pep trademark. The company has been in business since the early 1900s, first as a Quaker Oats brand. Then it changed ownership to Wayne Feeds and eventually Continental Grain. Greg Gossett’s father, Dr. J.W. Gossett, acquired Continental Grain and continued the Ful-O-Pep Feeds reputation for being a quality full-line commercial feed manufacturer. Today, Allied Feeds manages two storefronts, one in San Antonio and one in Cuero, Texas. It was just after the San Antonio Stock Show and Rodeo in 2012 that Dennis Delaney and Jay Willingham came to see Dennis Jemelka about selling BioZyme products. At the same time, the Cuero store was receiving calls for Sure Champ®. Since Ful-O-Pep Feeds already produced its own full-line of livestock show feed, Jemelka says BioZyme fit well with the store’s commitment to quality and fit the company price niche as well. Allied Feeds and the BioZyme line of products offer something for everyone. Ranchers will use quality feed and supplements because they increase performance and maximize efficiency. Livestock show customers are willing to invest in top-of-the-line products because they want the best for their animals, and their goal is to win. One of the Ful-O-Pep Feeds sales managers had children who showed steers. Naturally, they began using the products, which gave Jemelka a first-hand testimonial on how Sure Champ products work. He says the prebiotics and organic minerals all add up to be worth the investment. The selling point came when Jemelka could tell families they didn’t have to add any other top-dress supplements to their show feeds if they used Sure Champ from the beginning. Better digestion equates to more energy. As the calves mature, feeding Sure Champ will keep the animals in shape and they won’t go off feed. Jemelka reassures customers it has a high trace mineral content, which adds to the value of the product. Allied Feeds recognizes the value of its show customers and offers several incentives to reward them for their business. One program is called Jackets for Champions. The store offers a jacket to any customer who earns a Grand or Reserve Grand Champion title at the local or state level. The store also participates in the county level premium auctions. Jemelka says there are so many winners that use Ful-O-Pep Feeds products that it’s hard to reward them all, but Ful-O-Pep Feeds does give add-on premiums to as many as possible. There are occasions where the store is asked to visit with 4-H groups and FFA chapters to show livestock exhibitors what and how to feed. Jemelka says Allied Feeds wants to teach them about new products with the goal that a younger generation will learn the benefits of the Ful-O-Pep Feeds line. Ful-O-Pep Feeds encourages its dealers to attend livestock shows and be among the people who need its products. He says the Rio Grande Valley is a specific area for livestock show families and the company’s San Antonio store makes textured feed and grains, which caters to more of the Valley’s show market. At one time, Jemelka says the store was making 80 tons of pelleted show goat feed in one week. Make sure your display fully embraces the product brand. BioZyme® invests a great deal of money and energy promoting brands to the end customer, and therefore, it would be in your best interest to stay consistent with the respective brand look. Because of the diversity in types of dealers within our networks, we are happy to discuss options in customizing a display to fit your space. Communicating a clear understanding of what a product does is key to successful selling. Remember that communication is not limited to words: both the visual and written language of a display must also carry a cohesive message. A successful design is one that will seamlessly integrate with the rest of your marketing campaign (and in this case, the national marketing campaign efforts of BioZyme brands). Ultimately, every display has one goal: to sell product! Displays that overwhelm the product defeat their purpose at retail. Make sure that your display is making the product the star. 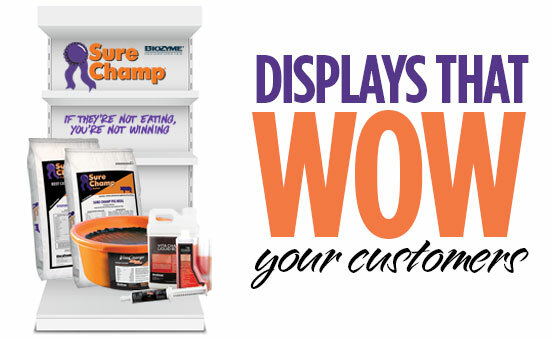 If your retail area does not have enough space to showcase every product, make sure you are highlighting those small pack products (Vita Charge®, Vitalize and the new Sure Champ® Spark) as conversation starters so you can lead in to telling customers about the larger mineral products available as well. Every new display project is an opportunity to create value for your customer. Value can be created through timely placement (putting the right product out at the right time), added education or a sales promotion or bundled products. Consider a display that can be changed according to time of year so your customer benefits when most appropriate for their business. For help with your store displays, contact Katie Vaz, Marketing and Communications Manager, at kvaz@biozymeinc.com or 816-596-8782. BioZyme® began its youth investment strategy in 2007. That year, we sponsored two Junior National beef shows – Angus and Hereford. Today, we sponsor 13 – World Pork Expo, Hereford, Angus, Simmental, Shorthorn, Gelbvieh, Red Angus, Maine and Chi, Saler, Charolais, Limousin, Mini Hereford, and Brahman. The reason we choose to make this investment is simple. Youth are the future. The next question that always gets asked is how does this investment provide return. In the ag world, it is common to get calls from the locals – FFA, 4-H, local cattleman’s association – asking for sponsorships or for you to be a volunteer. Association trade shows and exhibitions also turn to sponsors to get their program off the ground. In most cases, these organizations will ask for a modest amount ranging from a few hundred to a few thousand dollars in exchange for some type of advertising, like logos or banners. Deciding what to sponsor can be tricky, as certain opportunities may be a complete waste of money, while others may pay off in gold (i.e. marketing your company to potential customers). In addition, sponsoring an event for someone who already sings praises about your dealership enhances that relationship, and because you are helping him or her meet a goal, they sing even louder. Which business goal does it help me complete? How does this enhance my credibility with who/what I’m helping? After you decide to invest, don’t forget to assess the results. Some metrics you should consider analyzing include: sales activity, lead generation, lower customer acquisition cost and/or attitudes toward your brand or business. 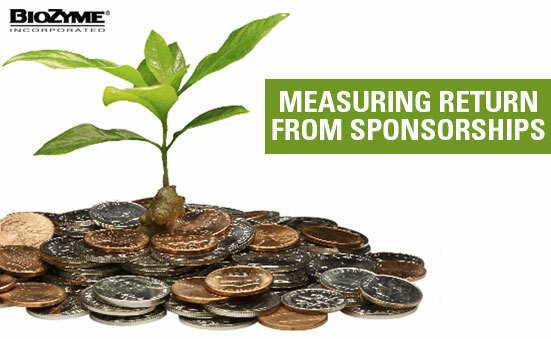 BioZyme looks to Sure Champ® sales as our metric to measure success. The below graph shows the investment is paying off in more than just goodwill. At the end of the day, the key to managing sponsorships is ensuring you get the “best bang for your buck”, while minimizing risk to your brand or business. I am sure the sponsors of the 2012 ING NYC Marathon did their due diligence. Unfortunately, they could have never predicted an event the magnitude of Hurricane Sandy. City officials, sponsors, as well as race organizers were divided on whether or not to proceed. It was a difficult decision to cancel, but the right decision. So, whether you are a title sponsor for a major event, like ING, or a smaller sponsor at a local event, setting your objectives, ensuring you have the right sponsorship partner, leveraging the association beyond just a sign, will yield better business in the long run. While many of our “Know Your Customer” articles focus on gathering data or technology that effectively helps you stay in front of your audience, we never want to undermine the value of a genuine customer relationship. 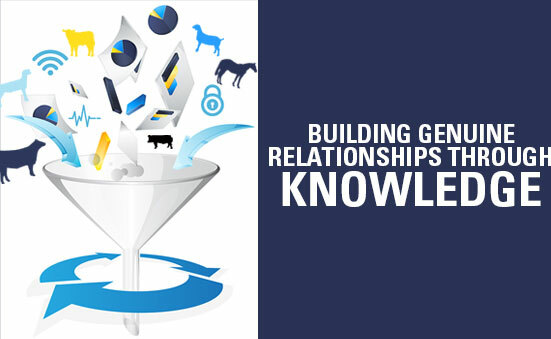 Our animal nutrition industry tends to be more relationship driven as many of the people who own, manage or support businesses, like your dealership, are also in the business. This results in easy conversation, a real understanding of customer needs and a true comfort level between the business and customer. While we may be preaching to the choir on this one, we want to offer a few techniques to ensure your customer relationship is genuine and true. Be patient in building new relationships. Relationships take time. Resist indulging in disingenuous schmoozing, as it can be a severe put-off. Instead, take the time to get to know your customer, and share a little bit of yourself. Most importantly, remember that the product and service you provide is paramount in building a relationship. At the end of the day, no amount of personal connection can substitute for great product and service. We have a vast amount of segments within animal nutrition. While you may be an expert in the cattle business, equine or rabbits may not be your forte. You don’t have to be a professional, but learn to speak the same language as your customer, understand what keeps them up at night, and cater your interaction and products accordingly. As you grow your business and your customer relationships, there will be times that you’ll have to make a decision on when to adjust or expand your products and services to cater to the needs of a customer. The benefits of offering customized solutions are two-fold: 1) customers remember the times you came through for them and 2) it may open up additional revenue streams and new product offerings you had not previously considered. Treat every client as your most important one. Simply put, happy customers are more likely to make referrals. Provide all customers with your best service, regardless of whether they are a large ranch that run thousands of head or a family just getting started showing. You never know whom your customers may know or to whom they will refer you. When a customer calls, emails or messages you on a social channel, acknowledge the receipt of the communication as quickly as possible, even if you do not have the answer they are looking for. You will give them comfort by simply acknowledging the receipt of their request and by communicating that you’re on it. This may seem like a no-brainer, but we often see dealers worry about having the right answer, and as a result, they forget to acknowledge they are looking for a solution. Be more than a contact. Despite the importance of collecting an email address, cell phone number for text messaging services, a social handle etc., these types of communication can often be misconstrued, especially during stressful situations. Consider a phone call or an in-person meeting to put a face (or voice) to a name. Often the phone gets a bad reputation when using it to ‘get on the same page’, but if used for good news, a phone call is a great way to build a better relationship with your customer. Every customer segment in your business has events they attend. Your show audience gather at the county fair or local 4-H or FFA events, your equine customers at rodeos and your cattlemen at field days. Seeing your face and knowing you care enough to attend these events to show your support or learn more about their involvement will not go unnoticed. Consider participating in those events, offering your time or sponsorship. With every new technological advance in communication, there is nothing more important or powerful than face-to-face interaction.